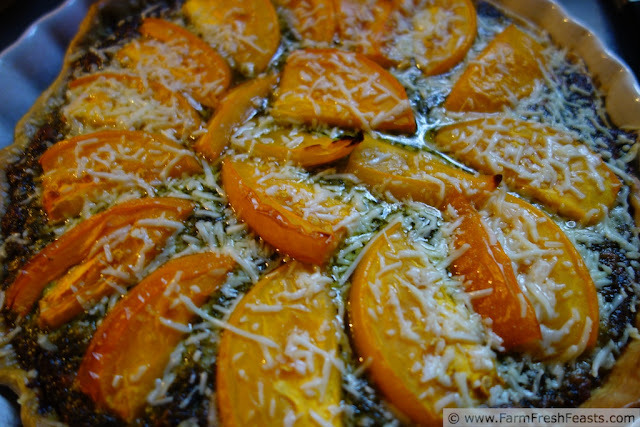 A late summer tart of ripe yellow tomatoes on top of a bed of rich basil and cheese, baked in a tart shell. A decadent vegetarian dish. Updated in 2015 with new photos! This dish, more than any other one I make, screams SUMMER! to me. I first tried it at a party in Hawaii, asked for the recipe on the spot, and have carried that stained sheet of paper around with me for many moves. I've shared this dish with so many folks but I'm putting it up here too. More photos, because I make this every year when I get yellow tomatoes! Even though this is a summer dish to me, I also love it in the early fall, when we still have ripe tomatoes and I'm happy to turn on the oven. If your family's favorite football team happens to wear green and gold, then making this tart for game night, using yellow tomatoes, would be extra festive. For more recipes using ripe yellow and or red tomatoes, please see my Red & Yellow Tomato Recipes Collection (not to be confused with the Green Tomato Recipes Collection). 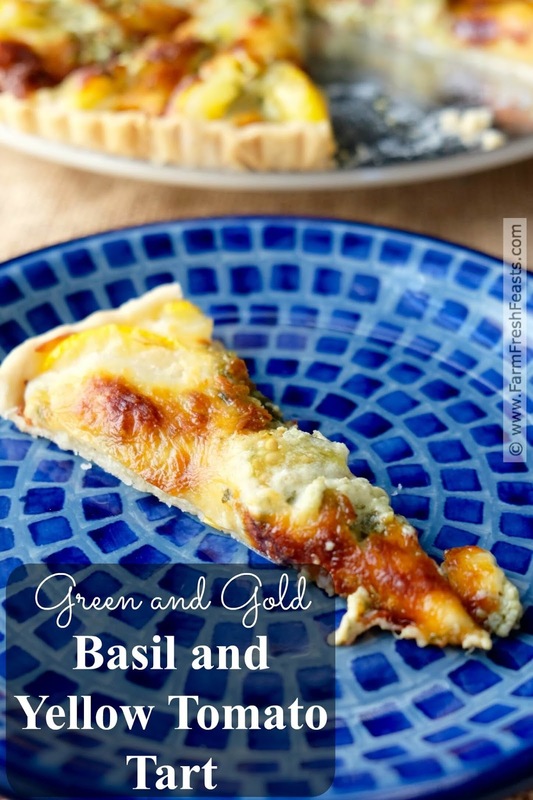 For more recipes using up basil or other herbs, please see my Recipes Using Herbs Collection. These recipes are part of the Visual Recipe Index by Ingredient, a resource for folks like me eating from the farm share, the farmer's market, and seasonal garden abundance. Want even more tomato ideas? I've got a board devoted to tomato recipes from around the web on Pinterest. Curious how to use this blog? Click here. 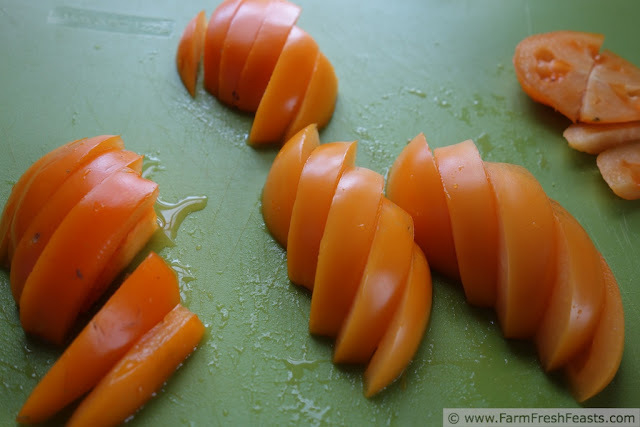 Save the tomato tops for the composting pigs! Or compost. Your choice. 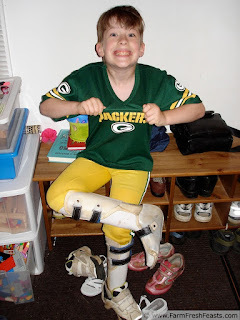 Even if your team colors aren't green and gold, you should make this. If you've got pesto already, this tart goes together super fast. But if you have fresh tomatoes, then there's probably fresh basil nearby so with a few extra steps you're ready to bake. This is a rich dish. If you want something with a little more veggie, try my Mediterranean Tomato Pie which skips the mayo and uses artichokes and olives instead. 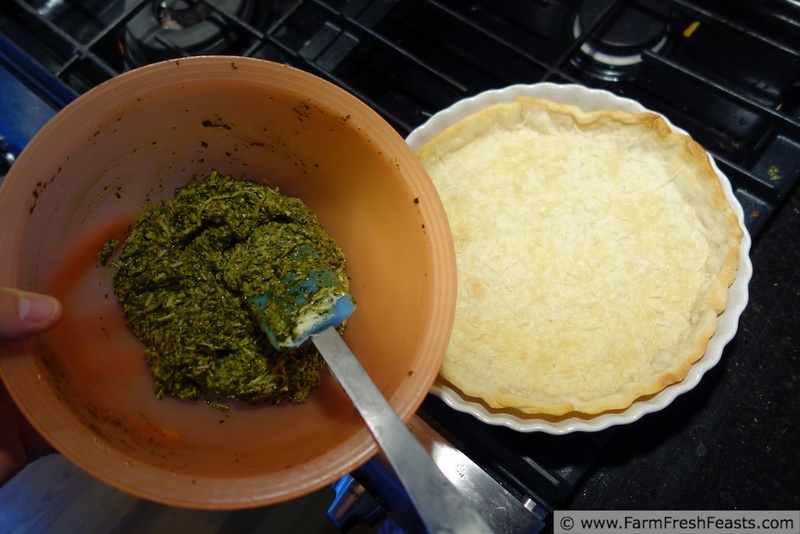 If you've got heirloom tomatoes and garlic scapes, I'd be remiss if I didn't recommend my Heirloom Tomato and Garlic Scape Pesto Tart. Slice the tomatoes and set aside to drain a bit onto a towel. Place the pie crust in a tart pan or pie plate, press into the sides, and prick with a fork. Cover the crust with aluminum foil. Bake 8 minutes. Remove foil and bake an additional 4 minutes. Remove from oven. Reduce oven to 375 degrees Fahrenheit. Top the prebaked crust with 1/2 cup shredded cheese. 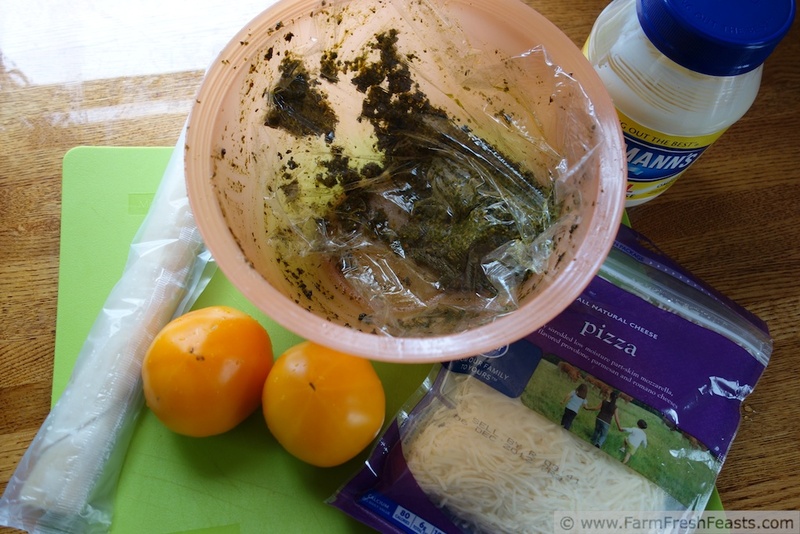 Mix 3/4 cup shredded cheese with the pesto. 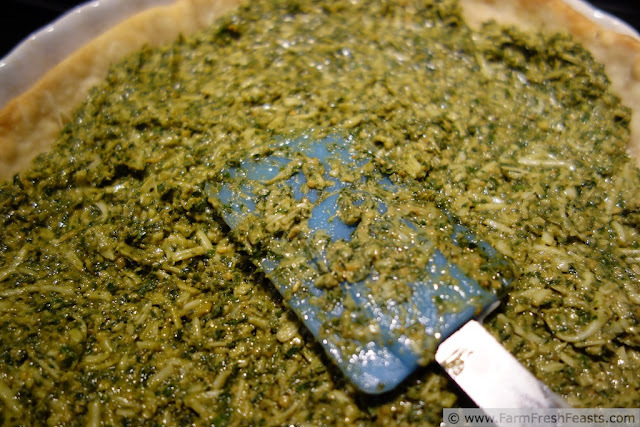 Spread the pesto mixture across the cheesy crust. Arrange the tomatoes over top the pesto. Top with the rest of the shredded cheese, and shake some parmesan over the top. Bake 35-45 minutes until the cheese is browned and bubbly. Serve hot, warm, or straight of out the fridge for breakfast the next morning. 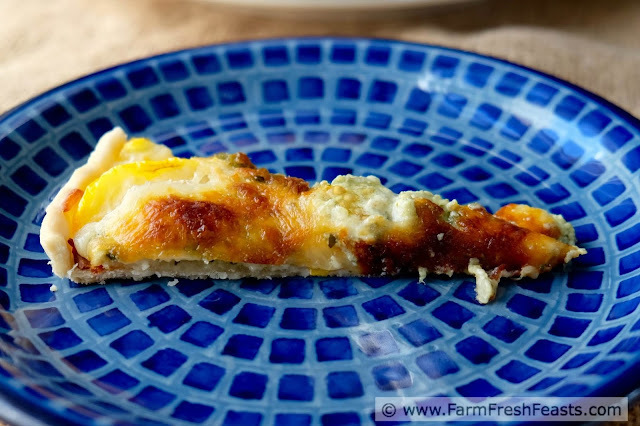 NOTE: The inspiring recipe from Better Homes and Gardens calls for spreading 1 cup chopped basil leaves over the crust, then mixing 1/2 cup mayonnaise, 4 cloves of garlic and the rest of the shredded cheese together and dolloping it on top. If I don't have pesto handy I do that, too. 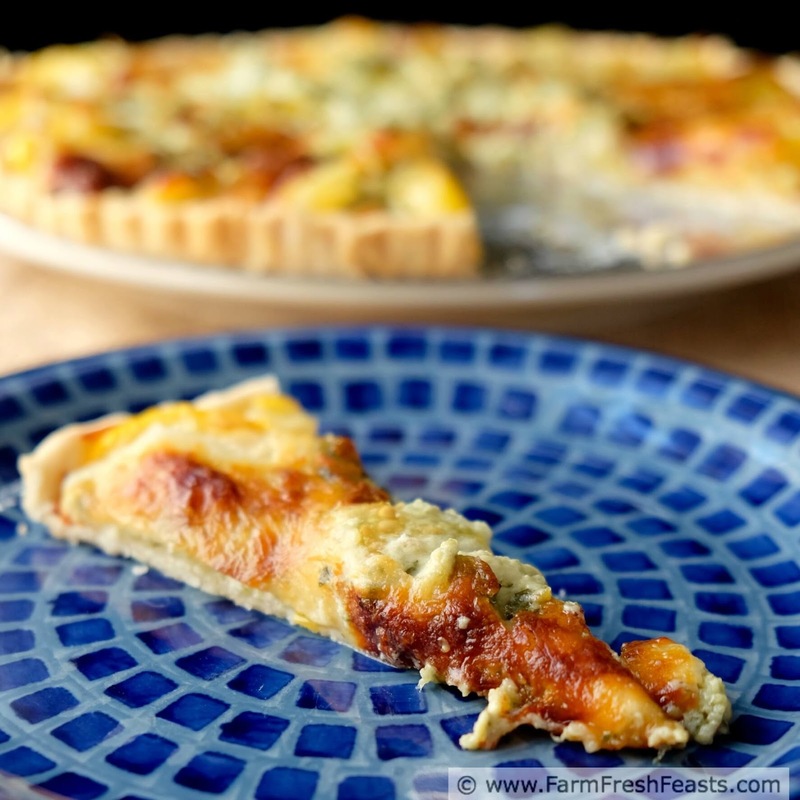 This tart joins the clever chicks at the Clever Chicks Blog Hop, Tasty Tuesdays, the Wednesday Fresh Foods Link Up, What's In The Box, Carole's Chatter and the From The Farm Blog Hop. I'm sorry, comments are closed on this post due to excessive spam. If you'd like to share your thoughts, please go to my FB page. Thanks! Beautiful! I love the pesto. Tomatoes and pesto are such a great combination. Well aren't I particularly pleased I have pesto handy. Now I need tomatoes. I've been getting one every week in the CSA and there are so many things I want to make with it, but the tomato gets used up so quickly, so I'll just have to be patient (so not my strong suit). Isn't it cool how stuff that's ripe together at the same time tastes great together? It really is. Nature's way of saying eat this and this, and it'll be good. This reminds me of the Frog Belly Green pizza at our neighborhood pizzeria– pesto and roma tomatoes over mozzarella, parmesan, and an olive oil glaze It's really good. I'm going to have to make a similar pizza, or as you suggest, tart. That sounds delicious (ok, Frog Belly Green sounds kinda weird) but the toppings-oh, yum! You've inspired me to turn my tart into a pizza, too. That is gorgeous! Tomatoes and pesto go perfectly together - I'd love to try something like this during tomato season. Thanks! I enjoy eating seasonally because the flavors of ripe fruits and vegetables are so amazing. I've got tomatoes on my plants, so it's just a matter of time. This looks so beautiful . What a great presentation and fairly easy to make too.. You are right, it screams summer! Your green and gold basil tomato tart looks just amazing. This is one recipe I can't wait to try. You also did a great job on the tutorial. To: "me"
I appreciate you hosting a great link up. It's late here, and I looked at your photo before I read your title and I said: PEACHES and PESTO?! lol. BUt, this makes a lot more sense now that I've had a bit of caffeine. It sounds delicious! :) Thank you so much for linking up with me this week at Tasty Tuesdays! I’ve pinned this & shared it with my followers! Please be sure to stop back by the party and check out some of the other links! Oh, Anyonita, not caffeine at night! I did that the other night to stay awake to have a video chat with my spouse, and then stayed up 4 more hours to boot, which made the following morning's medical emergency all the harder to handle. Early to bed, my friend! 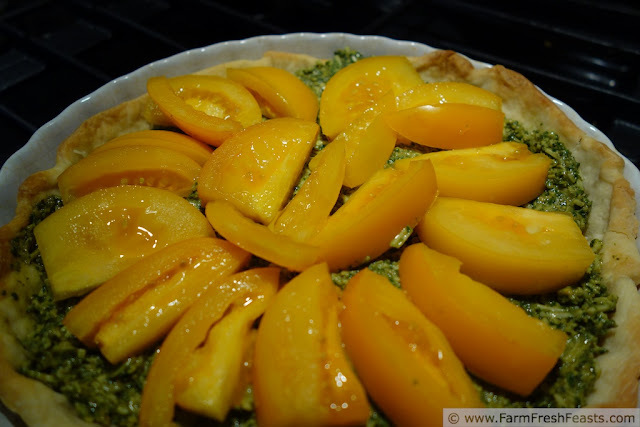 Though peaches and pesto sounds intriguing . . . .
my sister in law is going to flip over this recipe. she is the queen of all tomato dishes and i have a feeling this one will be her new favorite. It's a great dish--even for breakfast the next morning (along the lines of cold pizza for breakfast).